not applicable - measures 6"
Add to your ‘Abigail’s’ Christmas Tree Trim Collection with this fun, simple Santa Polar Bear Cub in Santa costume. 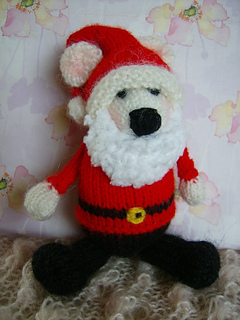 If made in DK (8 ply/worsted) he will measure 6” tall but he can be made in almost any yarn. It is preferable to use something slightly fuzzy i.e. a 10% mohair mix/angora mix/alpaca mix so you get the wonderful ‘halo’ effect on the yarn. As always, you are absolutely welcome to sell your knits for any purpose.